There are en-suite bathroom facilities for each of the large bedrooms, each of which has its own private balcony or terrace. Above all what we supply is peace and relaxation and a genuinely warm welcome. Las Chimeneas is a dramatic set of converted village houses which have been welcoming guests to the Alpujarra since 1998. There are nine lovely rooms, each with fabulous views across the hills to the sea in the far distance. We provide very comfortable accommodation, with lots of antiques and books and hidden nooks and crannies, together with a delightful little restaurant that will surprise you by the quality of its freshly made seasonal produce. We have a deep knowledge of the area and are anxious to share our enthusiasm for this place which has been our home for so long. We offer all kinds of holidays, including trekking, bird watching, cycling, painting, cookery and yoga. Of course we are also open for short stays for those wishing to come just for one or two nights. Above all what we supply is peace and relaxation and a genuinely warm welcome. This represents a very winning combination. Perhaps it is this that led The Times to number us amongst their Top Ten in Europe's best mountain hideaways in the Summer of 2018. Casa las Chimeneas is an extremely spacious house which has been restored in the local style and is furnished with authentic antiques throughout. In addition there are also three self catering studios/apartments which come fully equipped and which enjoy wood fires and stunning views. Rooms in The Casita, The Corral and The Azotea are decorated to the same high standard as Casa las Chimeneas. 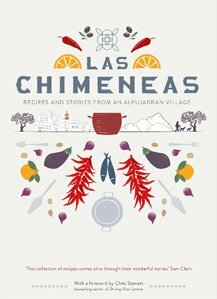 Our new book, Recipes and Stories from an Alpujarran Village, combines dozens of tried and tested recipes with essays and interviews with local characters which we hope will bring insight into this region that we love so much, and add flavour to the reading experience. Here is a summary of what's on this month at Las Chimeneas. We offer a wide variety of events, from art and nature treks to regular yoga classes. We’re also willing and able to put together personalised tours for people who wish to consider a specific, bespoke holiday to suit their exact and detailed needs.